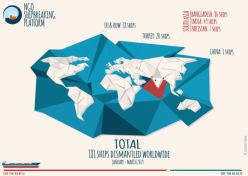 NGO Shipbreaking Platform, there were a total of 181 ships broken in the first quarter of 2019. Of these, 142 ships were sold to the beaches of South Asia where they were broken under conditions that cause irreversible damage to both human health and the environment. In the Q1 2019, US, Saudi Arabian and Singaporean ship owners sold the most ships to South Asian yards, followed by Greek and South Korean owners. Between January and March, three workers have lost their lives and four were severely injured when breaking ships in Bangladesh. On 28 January, according to local sources, Md Motiur Rahman lost his life while working at SS. Green Ship Breaking yard, located on the beach of Chittagong, Bangladesh. Twenty days later, a fire broke out in the engine room on board the Greek-owned Polembros’ tanker S WARRIOR at Shagorika Ship Breaking Yard, killing workers Md Jamil and Bipul. No severe accidents were reported in India and Pakistan. Whilst information on accidents in Alang remain difficult to obtain due to lack of access and transparency, a significant decrease in scrapping activities has no doubt contributed to a quarter with no recorded accidents in Gadani. In the last six months, 70% of the workers are said to have lost their job.